You know what's pretty similar to monkeys? Humans. For all the excitement surrounding CRISPR, there’s an essential question that is still unanswered: will it do only what we want? CRISPR is still new, and no one really knows its potential side effects. Does it cause cancer? How about unintended mutations? 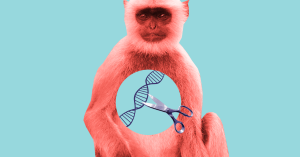 To get to the bottom of the issue, a team of researchers from China conducted a comprehensive assessment of CRISPR-modified monkeys, looking for any off-target mutations in the animals’ genomes. The study has not yet been peer reviewed, but the pre-print server bioRxiv published a version earlier this month. For their study, the researchers designed a CRISPR-Cas9 system to make the gene MCPH1 inactive in rhesus monkeys. Mutations in this gene cause the brain to develop abnormally, resulting in the medical condition microcephaly. The researchers injected their CRISPR-Cas9 system into 15 rhesus monkey zygotes (the single cell produced when sperm fertilizes an egg). They found that the MCPH1 knockout was successful in 13 of the resulting embryos (the next gestation stage, when the cell begins dividing and growing). This showed them their technique worked as they hoped. Armed with that knowledge, the researchers could start to address the question they were really after. The team injected their CRISPR-Cas9 system into 30 zygotes, 24 of which developed normally. They implanted those 24 zygotes into six surrogate female rhesus monkeys, and two became pregnant. One gave birth to twins, a male that survived and a female that did not. The other female gave birth via C-section to triplets, one female and two males, all of which survived. Now it was time to look for off-target mutations. The researchers found that their CRISPR gene modification worked in all but one of the monkey offspring, including the deceased female. Next, they looked for any de novo mutations (DNM), mutations that aren’t inherited, in the monkeys. They sequenced the whole genomes of each monkey and found that their CRISPR edits produced no DNMs (the monkeys did have some DNMs, but no more than the typical number for their species). Finally, the researchers looked at published whole genome sequencing data from a study that used CRISPR for “knock-ins” (adding or replacing a gene in DNA) in cynomolgus monkeys, a species often used for medical research. What they found confirmed the results of their own study: the animals exhibited no more DNMs than normal for the species. The researchers’ conclusion? “CRISPR-Cas9 can be considered a relatively safe gene editing system for primates,” according to their paper. Up until this point, most of the research into CRISPR’s potential to cause off-target mutations has been in either rats or human cells. This is the first study to analyze the whole genomes of CRISPR-edited non-human primates. And you know what is genetically and physiologically similar to monkeys? Humans. So this research is an important step in ensuring the technology is safe to use in humans. While DNMs aren’t the only potential unwanted side effect of gene-editing, they are one that a lot of people have been worried about. Now, we can be a little more confident they won’t be an issue as CRISPR moves closer to the applications we’ve all been hoping for.